An ortho mapping workspace is an ArcGIS Pro subproject that is dedicated to ortho mapping workflows. It is a container within an ArcGIS Pro project folder that binds together all the resources and derived files that belong to a single image collection in one ortho mapping task. In particular, it contains an image collection to be adjusted, which is managed using the mosaic dataset data model, the generated ortho mapping products, internal files used in the adjustment process, and necessary information that manages the workspace. You can copy or delete an ortho mapping workspace. You can have more than one ortho mapping workspace within a project, where each workspace opens its own map view. It is recommended that you use one project for each ortho mapping task. You can use multiple ortho mapping workspaces to manage the different versions of your ortho mapping tasks. You can rename an ortho mapping workspace if it is a copy of an existing workspace and no additional processes have been run on the new copy. You can create an ortho mapping workspace from drone imagery, satellite imagery (with a Rational Polynomial Coefficient [RPC] camera model), digital aerial imagery, scanned aerial photography, or an existing mosaic dataset. The type of ortho mapping workspace defines the methods and algorithms that are used to process the image type. Choose the appropriate type when you create an ortho mapping workspace for your data. The New Ortho Mapping Workspace wizard on the Imagery tab allows you to create an ortho mapping workspace from a collection of images or an existing mosaic dataset, and it also allows you to import or add from an existing ortho mapping workspace. The wizard guides you through the process of creating an ortho mapping workspace where you enter information to define your project, such as name, description, and workspace type. Depending on your type of workspace—for example, drone or satellite—the wizard pane presents appropriate options such as location of your source image collection, camera, or sensor model files, and spatial reference system. 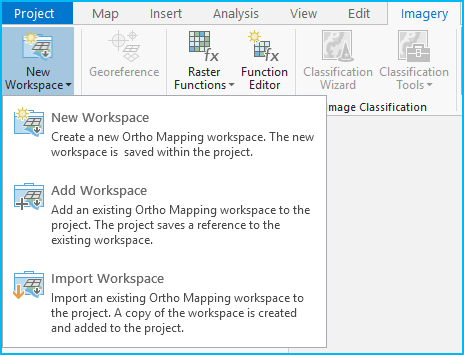 When you complete the New Ortho Mapping Workspace wizard, an Ortho Mapping folder appears in the project folder structure in the Catalog pane, and the List by Ortho Mapping Entities list view in the Contents pane allows you to view all the ortho mapping workspace entities created by the wizard. The entities in the ortho mapping workspace vary depending on the type of workspace you created. Model of the ground or bare earth calculated from overlapping images. Model of the surface, including above-ground features such as tree canopies and buildings calculated from overlapping images. Stores the computed transformation information for each image. ImageID—Image identification number. This will be the same value as the OBJECTID field in the mosaic dataset footprint table. RMS—The average Root Mean Square error for all the solution points in each image. RMS is expressed in pixel units. Quality—The quality of the adjustment for each image. A value of 1 indicates perfect quality. Contains all points resulting from the bundle block adjustment computation, such as the points in 3D ground coordinates. ImageID—The image identification number. This will be the same value as the OBJECTID field in the mosaic dataset footprint table. PointID— The block adjustment solution points derived from the corresponding tie points having the same PointID. 0—Adjusted solution point with x-,y-, and z-coordinates in map space. 1—Image point with row and column coordinates in image space. 0—Points that are excluded from the block adjustment computation. 1—Points that are included in the block adjustment computation. Residual—Residual error of the adjusted solution point. XResidual—Residual error in the x-direction of the adjusted solution point. YResidual—Residual error in the y-direction of the adjusted solution point. Contains all fiducials detected and used to refine the interior orientation. ImageX—X fiducial coordinate in image space. ImageY—Y fiducial coordinate in image space. FilmX—X fiducial coordinate in film space. FilmY—Y fiducial coordinate in film space. Score—The pixel-matching quality for each image. 0—Coordinate of the fiducial is not calculated; there was no result from the calculation. 1—Coordinate of the fiducial is calculated or defined. 2—Image is not solved; there was not enough information to construct the affine transformation. 3—Affine transformation for the image is solved. Residual—Residual error from transforming from film space to image space in the image. XResidual—Residual error in the X direction from transforming the fiducial from film space to image space. Contains control point coverage in areas where images overlap. Here you can identify areas that need additional control points to improve block adjustment results. Control points include ground control points (GCPs), tie points, and check points. ImageID2— Image identification number of the image that overlaps with the corresponding ImageID. ID—A unique identifier for the overlapping images consisting of ImageID and ImageID2, delimited by a period. Count—The number of overlapping images assessed. PointCount—The number of control points in the overlapping area. PointCoverage—The percentage of the overlap area covered by control points. Multirays—The number of unique PointIDs or tie point sets in the overlap area. 1—Rows that will be excluded in the computation. 2—Rows that will be included in the computation. Contains control point coverage for each image in the image collection. Here you can identify areas that need additional control points to improve the block adjustment results. Control points include GCPs, tie points, and check points. Coverage—The percentage of image area covered by control points. Count—The number of control points in the image. Multirays—The number of unique PointIDs or tie point sets in the image. Points with known ground coordinates, usually generated from ground survey. Points with known ground coordinates that are used for assessing the accuracy of the adjustment process. These are ground control survey points not used in computing the photogrammetric solution. Points representing pairs of pixels that correspond to the same location where images overlap. Tie points do not have known ground coordinates, but each has its own image coordinates in rows and columns. The flight path of the drone imaging platform. Drone sensor location and pointing information at the moment of image capture, including latitude, longitude, altitude, and time. The mosaic dataset created to manage the source imagery for the ortho mapping workspace. To learn about adjusting your imagery, see Block adjustment.